It’s back: One Week One Pattern – everything you need to know! Exciting news! The super popular One Week One Pattern is back. Originally launched in 2012 by Tilly and The Buttons, last year, the baton was passed to Sewisfaction and we’re delighted to be hosting again this year. We want as many people as possible to pledge, so we’ve pulled together a handy FAQ below so you can get the lowdown on this exciting challenge. What is One Week, One Pattern? Affectionally known as ‘OWOP’, it’s a photo challenge to try and get as many sewists as possible making the most out of their sewing patterns, by wearing garments made from ONE pattern for ONE week. This might be your favourite pattern you’ve made in lots of different fabrics, it might be one or two garments from the same pattern that you want to style in different ways, or you could be a pattern hacker who’s used the same pattern to make lots of different versions. The beauty of the challenge is that it’s totally up to you to choose which pattern and how you interpret it. Anyone! From complete beginners wanting to get more wear from their first makes, to more experienced sewers who love a ‘Franken-pattern’ and want to get hacking or show off their me-made wardrobes. You sign up following the info below, then whenMonday 26th November rolls around, you take a pic of yourself in your handmade OWOP outfit each day. 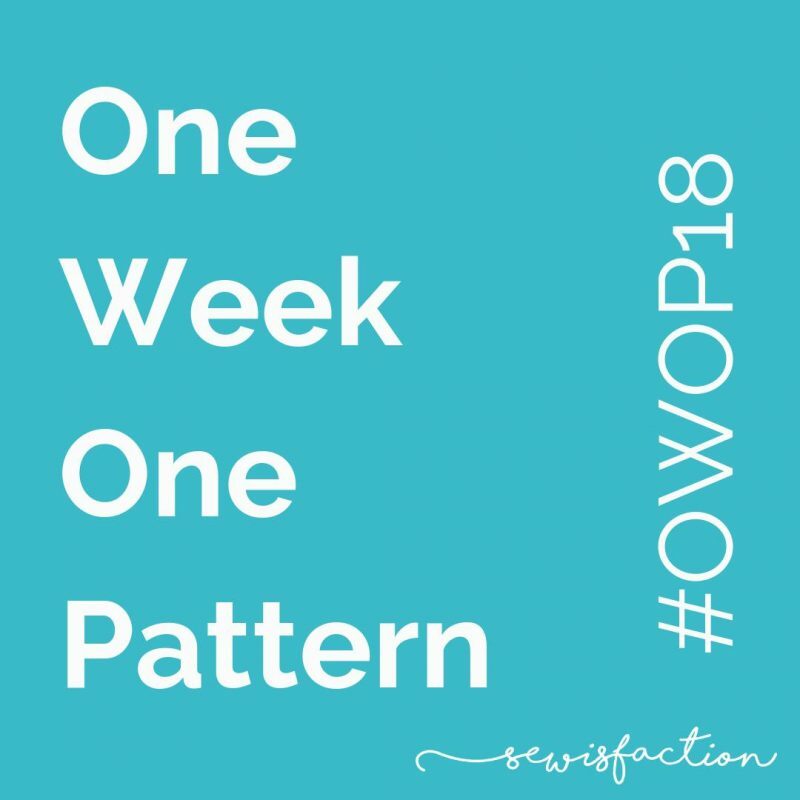 You can post on Instagram and use the hashtag #OWOP18 or if you’re not on Instagram, you can join our ‘Sewisfaction Sewcial’ Facebook Group which you can post into, or if your feeling particularly social you’re very welcome to post in both. The most important thing is that you sign up below first, as we’ll be cross referencing prize winners with the sign up post. Yes please do! Feel free to share your thoughts, tell people you’re participating and share your outfits during OWOP 2018. If you could link back to this post so others have the full details on how to join in themselves that would be great. So there you have it! I hope lots of you will join in with OWOP 2018, it’s such a great way to show off the creativity that the sewing community is just bursting with. There’ll be guest posts over the next few weeks to give you some inspiration and ideas, and we’re also compiling an AMAZING collection of prizes – more details to follow! Hello! My name is Joy of @pinkcoatclub and I’ll be wearing my Tilly and the Buttons Freya dresses and tops! I’m really looking forward to it this year! Can’t wait to see everyone’s outfits! I’d love to take part again. I need to decide which pattern this year though. Probably my Emery dress collection. Maybe. I’m in! Using the Tilly Buttons Freya sweater. 😊 I’ll be posting via my Instagram account @gingerscraps Thank you for running it again this year although this is my first time entering. I’ll be participating using my TNT sweatshirt pattern based on the crew neck shirt from the Sew U home stretch book. Really looking forward to taking part in this challenge and seeing everyone’s makes. I’ll be using Christine Haynes Emery dress. Hi, excited to take part in #owop this year! For me it will be the Tilly and the Buttons Coco Top & Dress. Hello everyone! I am Olympia @my_lovemade_wardrobe and I would love to participate with Sheona dress & top by @akpatterns. It’s my first time and I am so excited!!! Such a great idea, looking forward to it! I’ll be taking part on Instagram at @carmen.grantham with Simplicity Pattern 2365. Hi I’m Lucy. I will be participating in OWOP for the first time. Not sure what pattern yet, maybe the Linden by Grainline studio. TBC. Hi! I’m Karen (@hyacinthbloom on Instagram) and I’ll be taking part in OWOP this year with: McCalls, 6696, dress. I am Olympia from @my_lovemade_wardrobe and I am so excited to participate. I am going to use my favourite Sheona dress and top pattern. I would love to take part in the challenge! I will use Tilly and the Buttons’ Agnes top. Hi, I am taking part again this year and will be using the Grainline Linden pattern. I am @doobis71 on Instagram. I’m going to use the Cashmerette Montrose top. I’m signing up for the first time – thanks for hosting! My instagram is @carolynewendy I haven’t decided on a pattern yet, but probably either the Inari Tee, or the Ruffle Sleeve Top….or the Dove Top. I’m off to my sewing room to decide! Hi! I’ll be joining in with OWOP18. Thanks for organising it again. I’ve been pondering what pattern I can use for this, and I’m struggling – I don’t want to repeat any previous OWOPs! Also, the dress I’ve got the most versions of they’re all too summery to wear in November – even with tights and cardigans. For now, I’m thinking the Simple Sew Batwing Dress, but I may comment on this later to change it. I’ll be instagramming, and I’m @missbeacurtis. Hi, I will be participating on Instagram with the Deer and Doe Plantain Tee. I’m going to try it – eek! I will probably go for the Tilly & the Buttons Coco dress/top but really TBC! Hi, I’m Raquel and I’ll be wearing Vogue 1422 dress for one week one pattern. I’ll be sharing my makes on Instagram @raquel_sewing_ and_knitting_asia . Hi, I am Kim and I will be using the Deer and Doe Plantain tee. I’m keen to take part in OWOP18 and it’s great to know you are hosting it. I’ll use the Grainline Archer and will post on Instagram, my IG handle is sewing_in_spain. Hello! I’ll be participating on instagram @etaudette with the Sew House Seven Tabor V-Neck shirt/sweater. Hi there I’m going to do OWOP18 with the Merchant and Mills Top 64 pattern ! Sorry!!! I posted several times, because my name wasn’t showing up and I though I was doing something wrong, cough, cough, embarassed giggle. Hi! I will be participating in the OWOP challenge this year using Instagram @sewemiesew … I will be using the Tilly and the Buttons Mama Agnes pattern. Tilly and the Buttons, Francoise dress. I would love to participate in the OWOP on Instagram @ nelidup – I’ll be showing off all the Ivy Pinafores by Jennifer Laurence in my wardrobe! I’m aiming to do the challenge. I’ll be styling my 3 versions of McCalls 7445 culottes and making a 4th version too. Hi! I’m Eleanor and I’ll be using a Burda Style skirt pattern from 09/2000. I’ll be posting on Instagram as @nelnanandnora. Hi, I will be participating with the Colette Patterns Moneta dress, which I love. Over on instagram my handle is Emmaandhermachine. Yay, this challenge is going to be so much fun!! New Look pattern, 6106, skirt. Me and my Deer & Doe Melilot Shirt obsession are IN! Hi, I’ll be taking part, posting on Instagram (@theruralsewist) showing you all my Grainline Studio Morris Blazer collection. Im going to join in, and I’ll be using either the Grainline Archer or the Megan Nielson Amber. I’m going to join in with either the Grainline Archer or the Megan Nielson Amber. I’ll be wearing the Rusholme Skirt by Wendy Ward, and I’m @cseneque on Instagram. Can’t wait to take part again this year!! I would like to participate in this years, OWOP!! I will be participating on Instagram @daniela.uzu Apologies, this is my second post, first one in hit on the button by mistake and the message was not complete! I,m looking forward to participating again, this year with the CompagnieM Susanne Cardigan, it’s flipping cold and I want to be cosy. Hi, I’m Dani (@pocketortwo on Instagram). I’ll be taking part with the Marilla Walker Roberts Collection pattern, which is variations on dungarees. I’m Caroline and I will be joining the fun of OWOP again this year with a selection of By Hand London Charlotte skirts. I don’t have IG or Facebook so I’ll take part in spirit only and write a round-up on my blog http://carolinejoynson.blogspot.com/ at the end of the week. Ruthypotts (instagram) – I’ll be playing along using Tilly and the buttons coco dress/top. This is going to be so much fun! I’ve been dithering if I can do it, so a last minute sign up from me! I’ll be using the Tilly and The Buttons Freya Top and/or dress! I’m in I need to defend last years victory! I used Astoria top. Hi, I’m going to take part with the basic pencil skirt block from ‘Fashion Patternmaking Techniques [vol1]’ by Antonio Donnanno. I’ve made four in the past couple of weeks so this challenge seems like the perfect way to see how the different versions/fabrics are working for me! My Instagram is @xinyue553. I’m taking part wearing my Tilly and the Buttons Agnes Pattern all week. I’ll use Sew Liberated’s Hinterland dress pattern. I totally love this challenge and only one I’m participating in this year. hi I will participate on instagram Thanks for hosting. My handle is nats_needles and I will be showcasing Nina Lees Carnanby dress. Perfect dress for our summer at the moment. I will hopefully be taking photos each day and posting on Instagram. My pattern will be the Blackwood cardigan by Helens Closet. This sounds fun. Not sure about the pattern yet but I’d better decide! I’ll be posting on Facebook using the Sweet Tee pattern from Patterns For Pirates. Hope I’m not too late!! Hi I’ll be participating on Instagram as @sewdalriada. Pattern is Tilly and the Buttons coco top/dress. Am I too late to the party ? I’ll be participating for the first time in #OWOP as fatspanna on Instagram, wearing the Tilly and the Buttons ‘Cleo’ dress.